It’s important to maximize after-school time with our kids in order to encourage free play time and enjoy quality time together as a family. I stare down at her smooth skin, her blonde hair flowing across her shoulders, her eyes closed tightly, and I realize that even though she’s right here in front of me, I miss her. This is the first time I’m seeing, truly seeing her today. The hours since she got home from school have been jam packed and overwhelming. Seeing her so still and peaceful makes my heart flutter a little bit faster. As I’m tucking my kids into bed at night, I often think back over the day and wish I had been more intentional with the time we had together after school. Watching them smile as we played a board game or card game. Seeing the pride in their eyes over their latest art masterpiece instead of their eyes glued to a screen. Squeezing their little hand in mine as we kick up fallen leaves during a walk after dinner. My husband and I have made the intentional decision to send our kids to public school, so we accept that they are away from us for a good chunk of the day. And as my kids are getting older, we’re also getting busier after school. We have soccer practice and dance class and church gatherings. The time can seem to slip right through our fingers. So the hours when we are together are precious, I want to maximize after-school time to actually enjoy that time with my kids. I also want my kids to have time and space to reconnect with the family, and to benefit from playing and just being kids. As my kids stumble through the door after school, backpacks and shoes flying in all directions, the very first thing they need is a snack. They’re hungry, right on the edge of being hangry, if we wait too long to eat. In order to avoid the serious meltdowns and poor behavior that make me want to hide in my closet with chocolate, I give them a healthy snack to fill them up and fuel their bodies, as soon as they walk in the door. I’ve found the best way to give my kids a snack is to just set it out on the table and let them discover and eat it on their own. When I ask them what they want for a snack it becomes too much of a struggle for them to make a decision. So I usually set out fruits or veggies with a healthy dip. And they devour them all on their own! But, a few nights a week we have the mad dash to get out the door to soccer practice or dance class on time. So we’ll grab a CLIF Kid Zbar® on our way out the door. These have become our go-to snack for fueling up on the go. CLIF Kid makes nutritious snacks with organic ingredients that are perfect for active and growing kids. My kids love the delicious flavors and I love knowing they’re getting nutrients they need. See how CLIF Kid continues to encourage kids to get out and play. We’ve avoided the blood sugar crash so we can all enjoy our time together for the rest of the evening. I want to encourage my kids to use their time for free and active play. I don’t want them to miss out on playing even though they’re in school for most of the day. I’ve shared before about how I manage after school screen time for my kids. But after too many doors slamming when I’ve told my kids screen time is over, I’ve decided to discourage screen time as much as possible on weeknights. It takes too much time away from other things we could be doing. Time we could be enjoying together as a family. Time my kids need to use to be active and playful. With a little planning and creativity, we’ve established a good routine that will help my kids to be healthy and thrive throughout the school year. Playing outside. As often as the weather allows I get my kids outside to play. Practicing soccer or basketball in the backyard, riding bikes, or swinging on our backyard swing set. Creative play. We value toys that encourage open ended play in our house. Building with LEGO, playing with wooden blocks or magnetic tiles, or creating art are favorite after school activities. My kids can do these either together or alone, depending on how they’re feeling. Guided play time. Playing a board game or card game together is a great way to teach our kids how to follow rules, to be good winners and losers, and how to get along with others. It also allows me to spend quality time talking and playing with them. For more on the importance of play, check out the book Play: How it Shapes the Brain, Opens the Imagination and Invigorates the Soul* by Stuart Brown M.D. After dinner, we have one last chance to connect with our kids before bedtime. On evenings when we don’t have other activities, we enjoy a family walk around our neighborhood. We often stop at a place for our kids to play where they can run laps on the track or play a pick up game of soccer with neighborhood friends. It’s a great way to keep our kids active and playing outside, even on busy school nights. Other nights we might stay home and savor our time together by getting involved in play time with our kids. As often as we can, we make the extra effort to stop and simply delight in our kids and spend special time with them. It’s incredibly fulfilling to see the contentment of the day in my kids eyes as I’m tucking them into bed at night when we’ve been intentional about our after-school time together. They enjoyed healthy food, played, created and stayed active, and reconnected to the family. They’re filled up physically and emotionally and ready to tackle the day that awaits for them the next morning! *And just in case you’re thinking that my family is perfect and you want us to adopt you, please know that this is just the way we try to intentionally maximize after-school time. But, our kids are still just kids, and we are still imperfect parents. We definitely have our fair share of crying, fighting, tantrums, and meltdowns even on our smoothest of days. 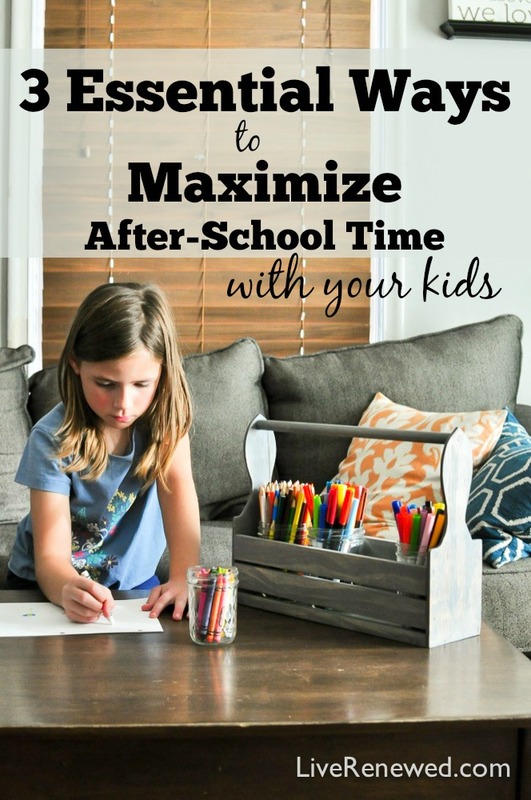 How do you intentionally maximize after-school time with your kids? What are your kids favorite ways to play, or your family’s favorite activities to do together? Share your ideas with us in the comments! Then, if this post has been helpful to you, please Share It with your friends, or Pin It to read again later! *This post contains affiliate links. If you purchase through a link I’ll receive a small commission at no extra cost to you. I’m curious when you schedule time for homework. Hi Jill! Thankfully my kids don’t have any homework because they attend a Montessori school – it’s just one of the many things we love about it. If they did have homework (which I know my oldest daughter will soon enough), I think we’d do it after our free play time and before dinner. That way they’ve still had the chance to play and be creative and move their bodies and then they can sit down and concentrate on their work. Hope that helps! do you think your kids will be able to cope with the stress of transitioning from a Montessori school to a highschool/Uni with homework? Do you think it might have a negative effect on their education process and/or ability to organize and set schedules for the daily tasks? P.S – My wife and I are quite busy during the week but I’ve made it my task to help my son with his homework (if he’s having any problems) when I come home after work right before dinner. After that it’s play/relax time. Also on Sundays and Saturdays we try to go out to the park or go hiking or work on a simple home DIY project. Hi Leo, I’m glad you’ve found a routine that works well for your family! Thanks for sharing your experience with us. I guess I’m not sure the purpose of your question. We will definitely help our kids through the transition to “traditional” school when it’s time. Until then, we are so thankful for the opportunity they have to learn at a Montessori school! Having to include something new in your daily schedule is always an adjustment. It is not necessarily easier to make that adjustment at an early age. My son did not have to get up “early” in the morning until he started kindergarten and therefore often stayed up “late” by kid standards and had a relaxed morning until I took him to childcare and myself to work when we were ready. For kindergarten, he had to be at school by 7:50, so his sleep schedule became earlier and stricter. He was quite used to it after just a couple of months. I never had homework until 5th grade; prior to that, I always was able to finish all my work during school hours. I did feel some sense of failure when this was no longer true and I had to bring work home some days–it wasn’t a daily thing until 7th grade. Sometimes I was upset that the work was “stupid” and I’d rather be doing other things. But the struggles were no worse than what I’ve had with my son, who was assigned homework beginning in kindergarten. It wasn’t harder because I started later. My parents talked me through deciding which time of day worked best for homework for me personally, and we adjusted family responsibilities so that each kid’s homework time was free of other chores. My university workload was far more demanding than high school and required major adjustment, without hands-on support from my parents. I worked it out using the tools and ideas for scheduling and task management that I’d used before or seen my parents using–making a weekly calendar and writing each task in red on the day it needs to be finished, blue on the days when you will be doing preliminary work on it, is a particularly helpful strategy I picked up from my mom. I think that at any age, we can learn to accommodate new responsibilities when we need to do so. Think of getting a pet, for example: You will get used to caring for your pet each day, and you can be a responsible pet owner even if you never had a pet before; you just work it into your schedule.